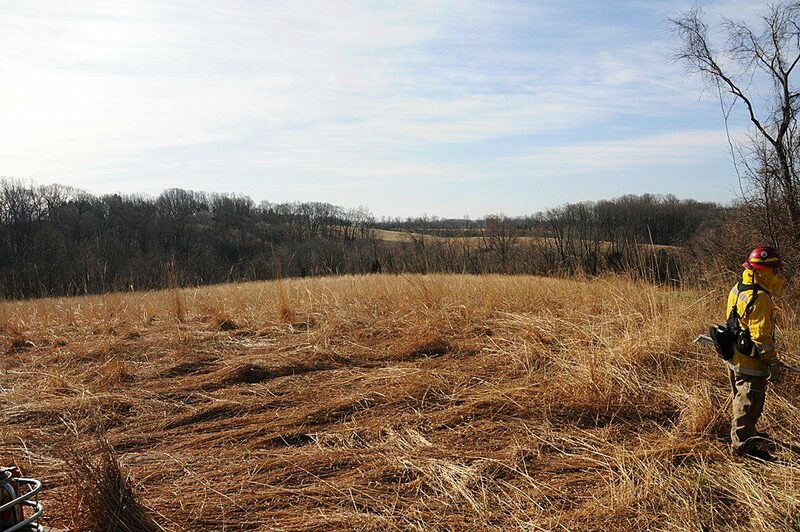 The field of warm season grasses on March 29, 2011, just prior to burning. Image by Derek Stoner. A new type of land managment tool is arriving in the Piedmont of Delaware, and this is one of the most simple techniques with which to revitalize grassland habitats: Fire! 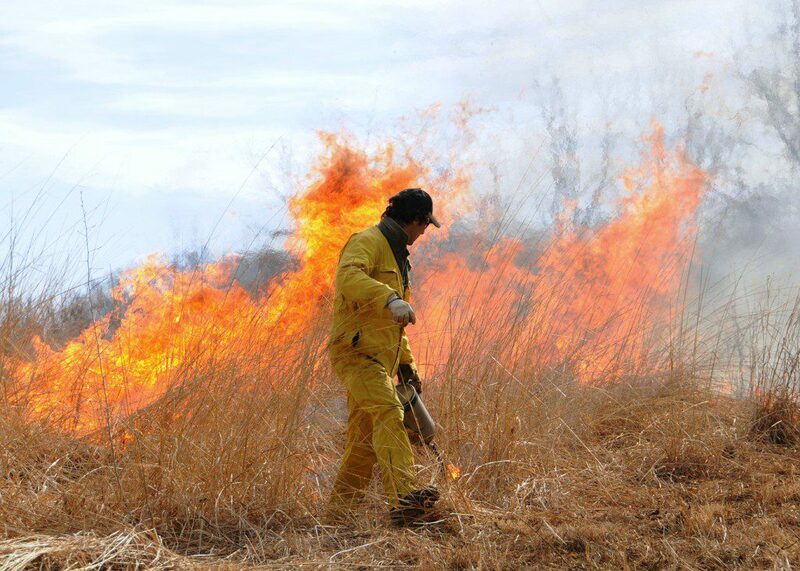 This past Spring, on March 29, for the first time in known memory a prescribed fire was conducted in the Piedmont region of Delaware. The challenge of managing a fire and timing it safely so as not to damage surrounding habitats is crucial. When the right conditions arrived in late March, the call was made for the fire crew to assemble and get to work. Delaware Nature Society Land Steward Dave Pro lays down a line of fire using a drip torch, igniting the dry grasses behind him. Image by Derek Stoner. Prescribed fire specialists from the Delaware Forest Service teamed up with staff from Flintwoods Preserve (led by land manager Jared Judy) and Delaware Nature Society Land and Biodiversity staff to conduct a prescribed fire on a 6-acre planted plot of native warm season grasses (Big Bluestem, Little Bluestem, and Indian Grass) at Coverdale Farm Preserve. 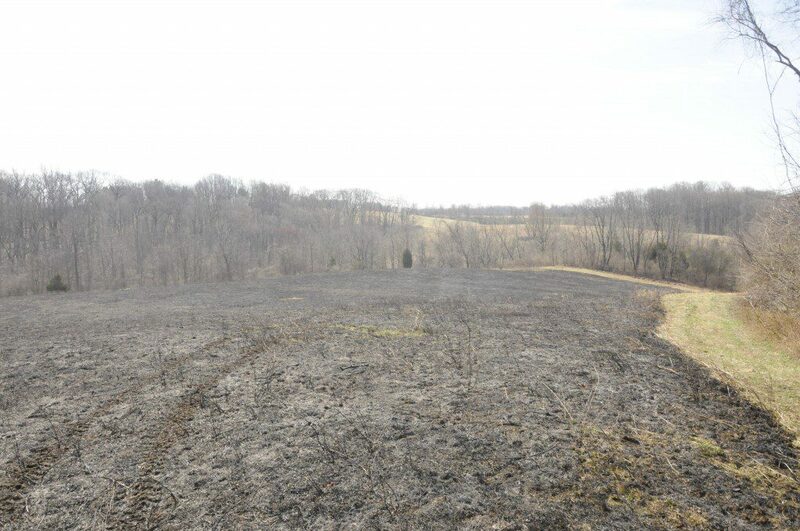 Immediately after the last flames died out, the field resembles a black landscape of scorched ground. Image by Derek Stoner. The burn went extremly well, and in less than 20 minutes, 6 acres of dried grasses were reduced to black ashes and a patch of ground that looked empty. The ashes would help fertilize the growth of grasses from the rootstocks underground, and within just a few days the field would turn green and lush with new plant life. I received my training in prescribed fire along the Gulf Coast of Texas with the Nature Conservancy. Nationally, the Nature Conservancy has adopted the standards of the National Wildfire Coordinating Group (NWCG) for their prescribed fire operations, allowing them to partner with state and federal agencies to conduct burns. Land managers and conservation staff within the Texas chapter are encouraged to obtain NWCG certification and training. When a land manager had units on their preserve ready to burn they would put out the call and the other land managers would travel from around the state to assist with the fire. It was termed the “fire militia”, as we all had other job responsibilities but understood that if we wanted to burn on our preserve we had to be there to assist others. When discussing warm season meadow establishment and management, prescribed fire must be part of the conversation. The scale of fire will be very different on the Delaware Piedmont than it was from the Texas Coast, but its role in meadow management should remain undiminished. Without the use of fire in our meadows on the Piedmont, their diversity and usability for wildlife will never reach its full potential. Prescribed fire associations, a collection of land managers and property owners interested in using fire as a management tool, are becoming common in many areas of the Midwest. The establishment of such an association allows for each landowner involved to dip into a collective pool of resources and personnel to accomplish a burn on their property. Also, grants are available to such associations to build an equipment cache to be shared among the members. Developing a burn association in the Delaware Piedmont could be an effective way to reintroduce fire into the system on a broad scale. Enjoy this fascinating video of the whole process of the prescribed fire at Coverdale Farm Preserve– you can hear the fire crackle and almost feel the heat! And stay tuned for an update of how the field re-generates immediately after the fire. Birders have their Christmas Bird Counts. Lepidopterists have their 4th of July Butterfly Count. Astronomers have their Star Parties. Herpetologists have their reptile round-ups and calling frog surveys. Why should botanists miss out on the fun! This is why we created the New Year’s Plant Count as an annual program offered by the Delaware Nature Society. Led by Botanist Janet Ebert each year just after the champagne bottles have been recycled and confetti swept up after New Year’s parties. This year the count was held at the Society’s headquarters, Ashland Nature Center. The goal is to find and list as many plant species as can be found in a 3-hour walk. You should know what plant this artistic and beautiful pattern comes from. Any guesses? Any plant counts for the Count, including trees, shrubs, vines, wildflowers, moss, ferns, and others. You might wonder why this is done in January. Most of the plants are present in one form or another, even though some might be a withered, brown stem that was a colorful, vibrant wildflower just months ago. Perhaps it is the challenge of identifying these species at this stage of their existence. Perhaps it is the anticipation of the coming spring and the need to prove that you can still see an awful lot of life, even in the middle of winter. For instance, even though we are months from spring beauties blooming in local woodlands, the counters found green leaves of the plant poking above ground last week, getting a head start on photosynthesis for the year. Purple deadnettle (Lamium purpureum) was found blooming on the count this year. 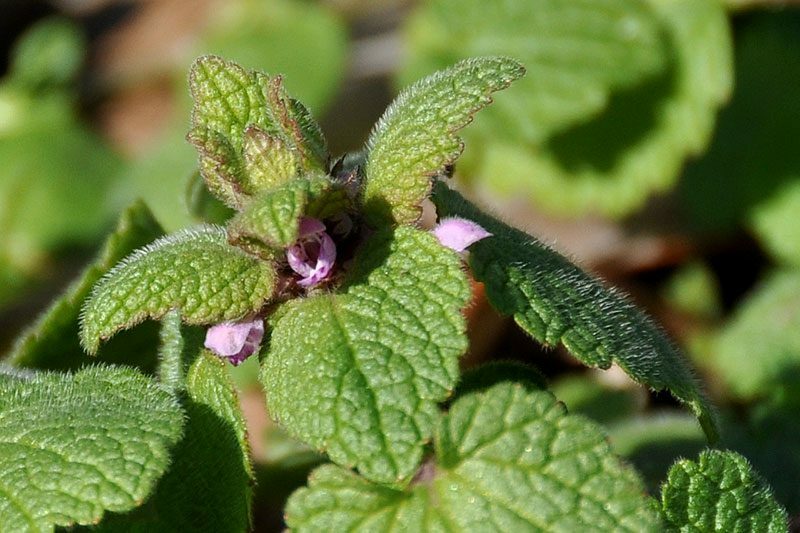 This non-native mint (it isn't a nettle) and many other kinds of non-native weedy plants are regularly found blooming in mild winters. Many alien plants are green and growing, and sometimes blooming in the middle of winter. Most of these are annuals or bienniels, whereas most of our native herbaceous plants are perennials, and are safely dormant underground until at least late March. This is a good time of year to spot the weedy non-native plants in your garden or yard…some of them are growing already! The New Year's Plant Counters found a few native green plants as well including this tree clubmoss (Dendrolycopodium obscurum) and the striped wintergreen (Chimaphila maculata) at its base. There are some native evergreen plants in our area, however, and the photo above shows two of them. 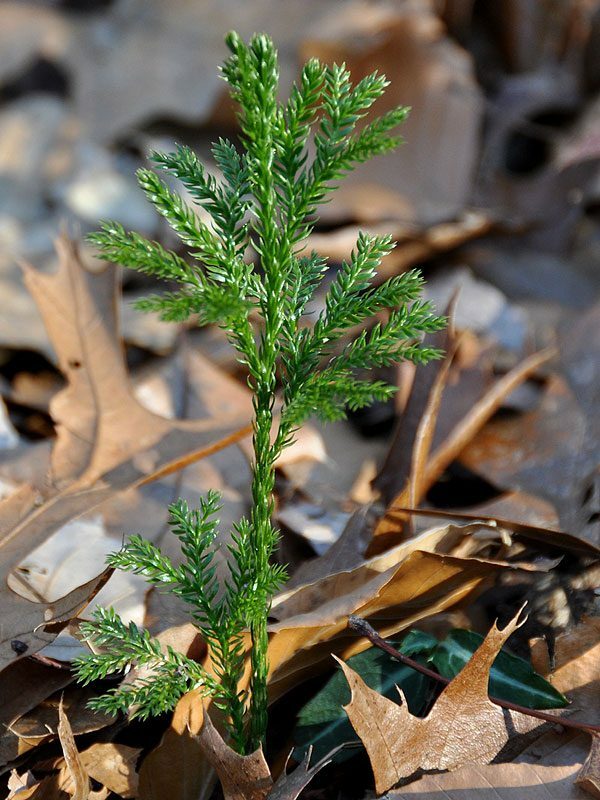 The tree clubmoss is not a moss, but a primitive, vascular, non-flowering, spore-producing plant related to ferns. The striped wintergreen to its right is a sub-shrub (I like that term) related to blueberry bushes. Both of these grown in dry, bare soil within forests. Skunk cabbage (Syplocarpus foetidus) is one of the very few native plants that flower this time of year. 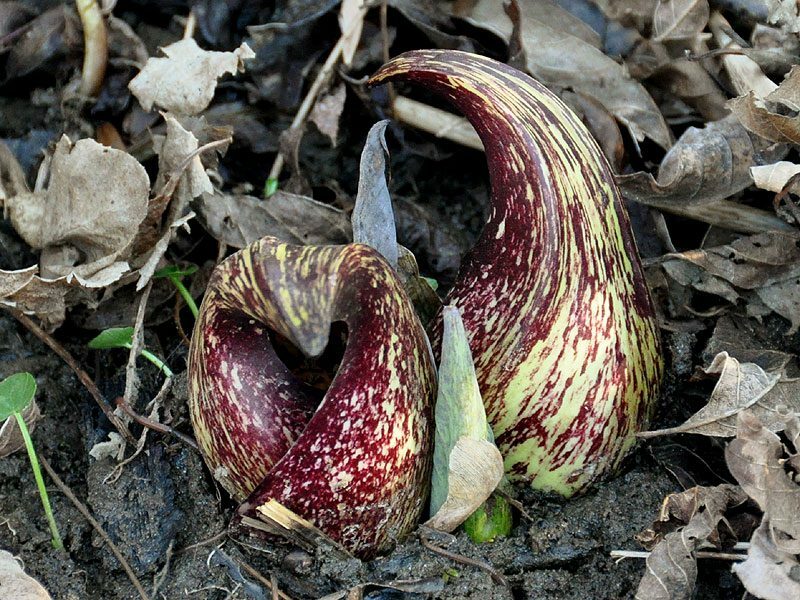 The skunk cabbage above (not a cabbage, but an Arum, related to Jack-in-the-pulpit), was found on the New Year’s Plant Count, and was blooming. A participant stuck their finger in the spadix, (hood that holds the flower), and some pollen rubbed off on them. This is an image of the fruiting bodies of a dodder, a parasitic plant. Another strange native plant that was found was a species of dodder (Cucuta sp.) that had the group scratching their heads as to its identity. 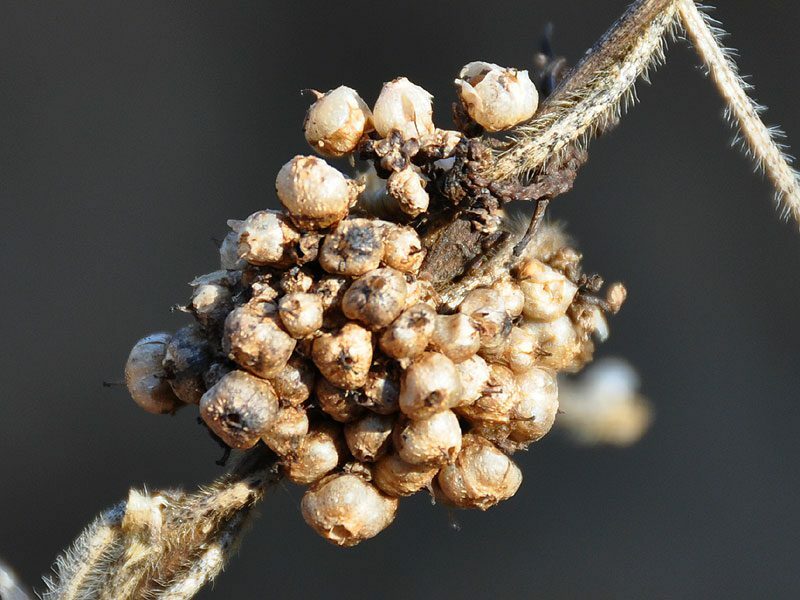 This parasitic plant starts its life innocently enough…sprouting from a seed on the ground. Before long, however, it wraps its spaghetti-like yellow stringers around the stems of other plants, stealing nutrients from them, and detaching itself from the ground. There are 5 species of dodder in the Delaware Piedmont, and Janet was pretty sure this was not the common type. Winter appreciation of plants many times simply has to do with form and structural beauty rather than naming species. 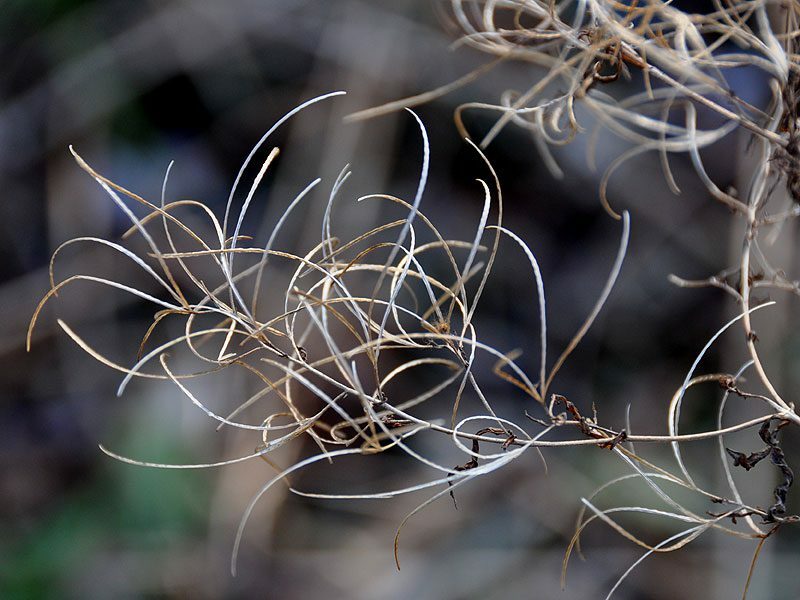 The delicate swirling strands of a willow-herb (Epilobium coloratum) are really long seed pods that are split open, whose seeds have long since floated away on the wind. Willow-herb is an obligate wetlands plant that has seeds with little parachute hairs enabling them to float away in the breeze. Register for this program next January to get out and appreciate the winter plant scene with professional botanist Janet Ebert. Like botany? 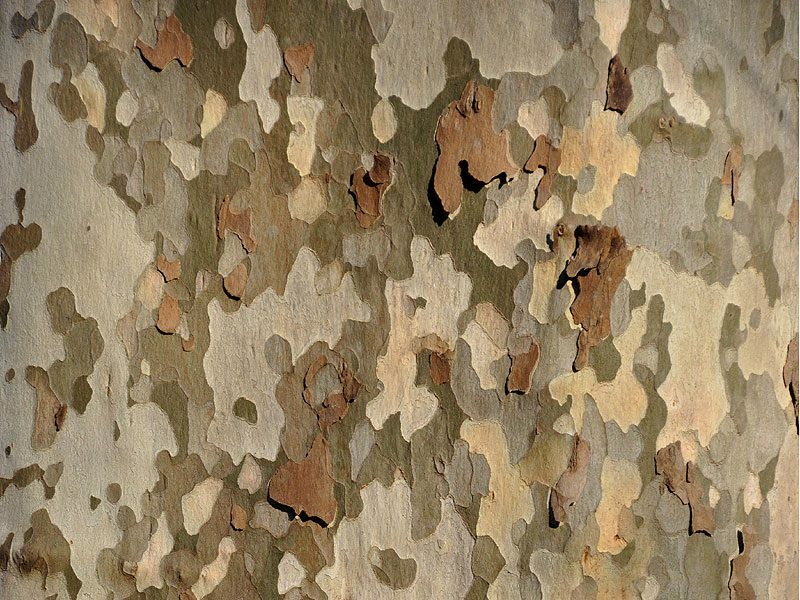 Try the upcoming programs…Winter Identification of Trees and Shrubs March 4, Spring Wildflower Walk and Brunch April 24, and the Susquehanna Wildflower Adventure April 30. Also, visit David Smith’s Delaware Wildflowers website, which is filled with great photos of our native plants. I would like to introduce myself. 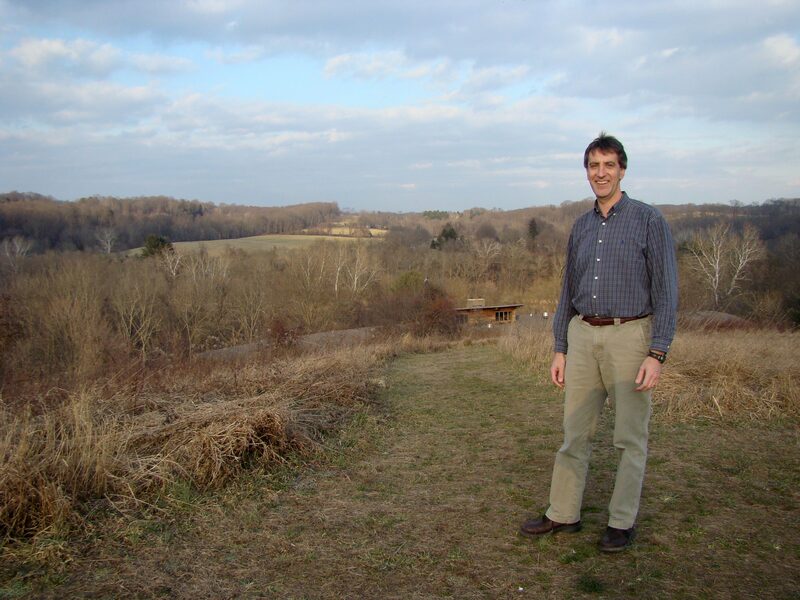 I am Brian Winslow, the new Executive Director of the Delaware Nature Society. In the coming months I will be touring the Nature Society’s sites and facilities as I learn more about the programs and activities. So I thought it would be a good idea to post a blog about some of my visits in the coming months. Some of the sites might be familiar to you, but maybe you haven’t visited them in awhile and others may be entirely new to you. After my first week on the job, I decided to take a hike at Ashland Nature Center on Saturday, January 7th. It was 55 degrees with partly cloudy skies. On my drive over, I was pleased to see how many people were out enjoying the weather with full parking areas at Brandywine State Park and Woodlawn. The roads were full of bikers as well (I wish I had brought my bike instead of cross country skis!). When I arrived at Ashland there were many hikers there as well as a cub scout troop. Brian Winslow stands on Hawk Watch Hill at Ashland Nature Center. Brian is the new Executive Director of the Delaware Nature Society. Hiking the Tree Top Trail was beautiful with great views of the Red Clay valley afforded only in winter with the leaves off the trees. My favorite spot was where the trail goes between two large Tulip Poplar trees, almost as if a grand entrance to the mature woods. On top of Hawk Watch Hill I met a young man, Sean, who had come up to watch the sun set and moon rise. What a great place for panoramic views, bird watching and just relaxing! A short distance down the trail I met former director Mike Riska with his wife enjoying the good weather. I feel so fortunate to follow Mike as Director and I am grateful for all the amazing things he has done in growing the Delaware Nature Society to what it is today. Seeing so many people outdoors hiking, biking, relaxing and learning affirms my belief in the value of open spaces, parks and scenic by-ways. It was a great end to my first week here and a great beginning to continuing the good work of the Delaware Nature Society. The Delaware Breeding Bird Atlas has just started its fifth and last year. While it is far too early in the year for most birds to be nesting, it is in fact a great time to look for nesting owls. 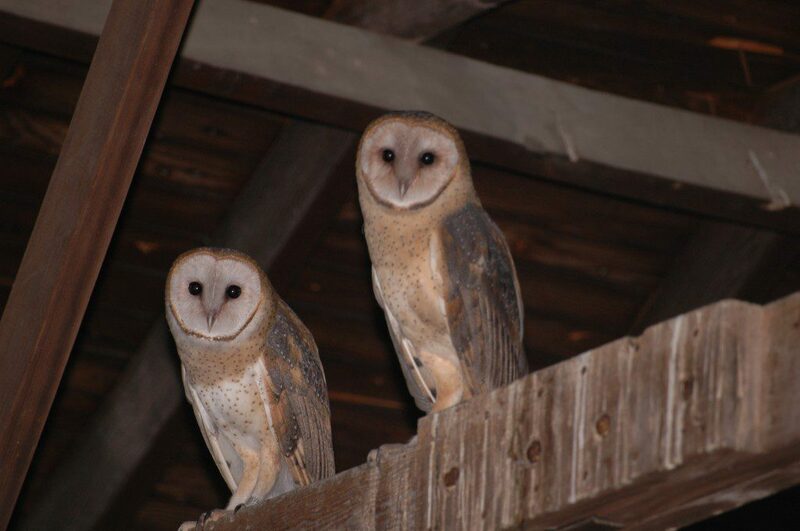 There are four species of owls that regularly nest in Delaware: Great Horned, Eastern Screech, Barred, and Barn Owls. The former three are nesting now and the latter will be nesting soon. 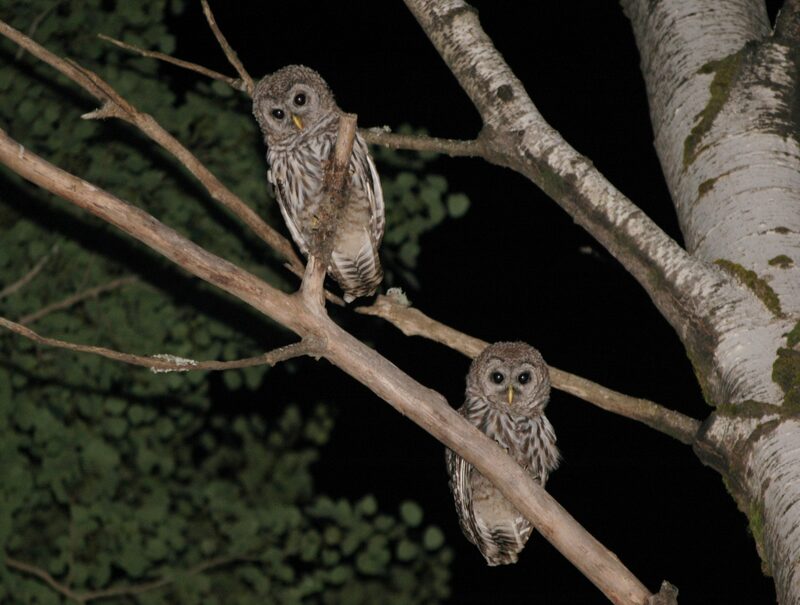 Jean Woods, Curator of Birds at the Delaware Museum of Natural History, is collecting data on nesting owls for the atlas project and is encouraging all birders to keep an ear out for calling owls and report any that are heard. In fact, she is challenging us to go out and actively look and listen for owls. This may sound a bit of a difficult, if not crazy task; however, it can be quite enjoyable and not that hard. Owls can be spotted during daylight hours; however, surveying for owls is best done on a quiet, windless night. Dusk can be a particularly good time to hear owls but owls can also be heard later in the night. For logistical, safety, and enjoyment reasons, owling is best done with a companion. 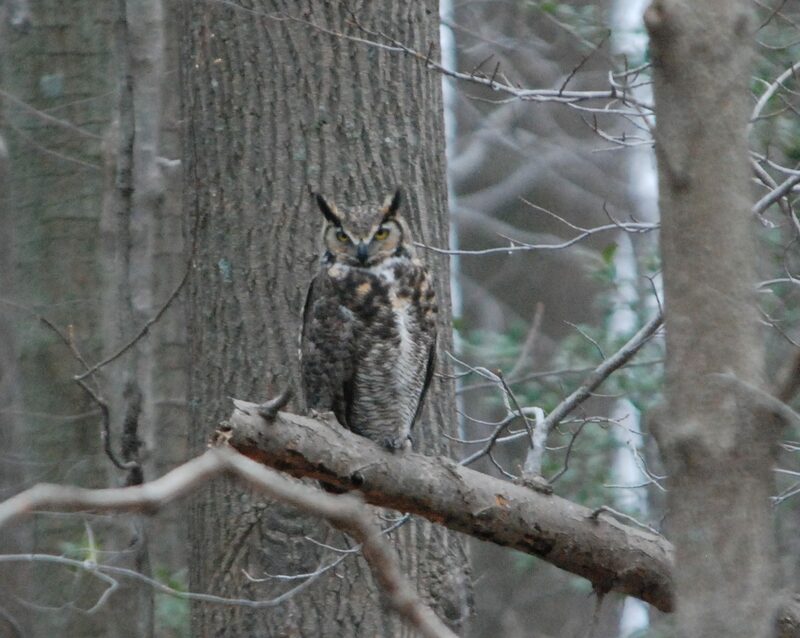 Great Horned and Eastern Screech-owls are relatively common in our area and can be found in most woods. Barred Owls typically are found in or near swamps, wet woodlands, or floodplains, while Barn Owls are birds of open areas such as freshwater marshes, saltmarshes and agricultural fields. Stopping safely along roads that pass through these habitats and listening for the owl’s distinctive calls can produce good results. Of course you have to know the calls of each species but don’t worry: learning them is not that hard. Owls have more than one type of call: fright calls, begging calls, aggressive calls, and the most commonly recognized advertisement call. The advertisement call, as you might expect, is usually the loudest call and is used to attract a mate or declare territory. The Great Horned Owl’s advertisement call is a classic hoo – h’HOO – hoo – hoo. The Eastern Screech-owl’s is a eerie high trill. The Barred Owl’s well known “Who cooks for you, who cooks for you all“ is hard to confuse. The Barn Owl has the least musical call of the four and is a high-pitched hissing scream. Owl calls can be heard at several websites, including Cornell Lab of Ornithology’s All About Birds. 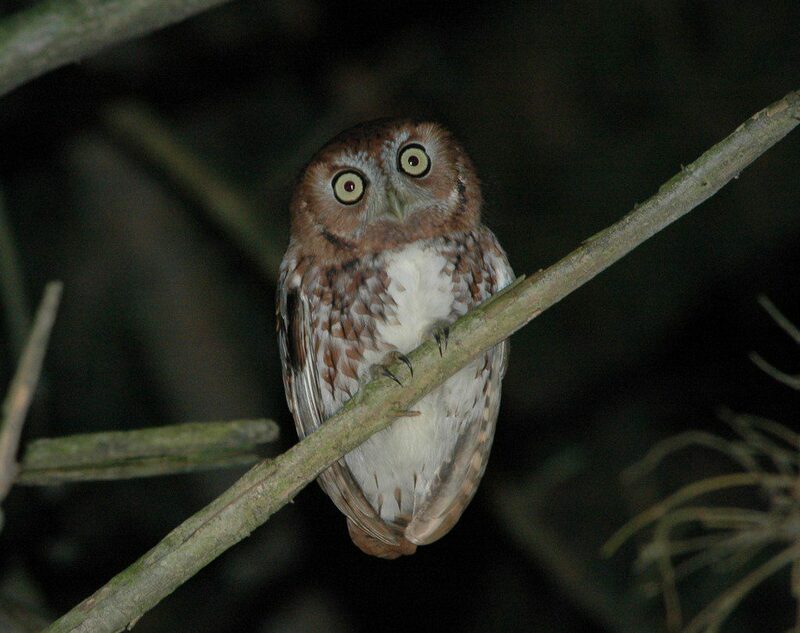 You can report any sighting or hearing of owls to Jean Woods at jwoods@delmnh.org. Click this link for more information about the Delaware Breeding Bird Atlas. To find out what breeding bird atlas blocks still need owl breeding records, click here. So get out there, have some fun and collect some valuable data on Delaware’s breeding owls. If you would like to join me on a day-long owling adventure, register for the Delaware Nature Society program Owls at Other Winter Raptors which takes place Sunday, February 12. On this field trip, we try to find the owls mentioned in this story plus wintering Northern Saw-whet Owl, Short-eared Owl, Long-eared Owl, and if we are really lucky…Snowy Owl.